In the documentary Iris, the stylish 93-year-old Iris Apfel says something close to, “I don’t like pretty. I have no use for pretty. I know people don’t agree with me, but there you have it.” The camera lingers uncomfortably long on her. She finally turns away. There’s nothing pretty about Iris Apfel, but her marvelous excess is riveting. I bet she would love Estée Lauder Estée. Bernard Chant created Estée, Estée Lauder’s second fragrance after Youth Dew. Estée launched in 1968. Its notes include jasmine, rose, muguet, coriander, ylang ylang, orris, sandalwood and moss. Those notes sound mild and “pretty,” but wearing Estée is like biting into a fresh kumquat. For a second or two you think you’ve made a dire mistake, but then the kumquat’s threatening tang turns into delicious fruit. Similarly, at first on skin, Estée is a thunderhead of aldehydes with a foghorn of oakmoss sounding below it. It’s amazing how a tiny spritz of liquid can whip up such a wild storm. At this point, Estée is big — potentially overwhelming — and it’s hard to see if there’s a perfume in there. But after a few minutes, orange flower rises to take over for the fading buzz of the aldehydes, and the fragrance’s calm, slightly spicy floral heart appears. The storm is over, and Estée becomes a vaguely soapy, velvety soft floral perfume with an intriguing hint of coriander. Oakmoss still rumbles in the background, but now Estée has left the stage at the opera and is ready for a garden party. Its dry down is sweet and soft and mossy. The Estée Lauder website says, “Once, at a party, Mrs. Lauder had noticed the light from two crystal chandeliers shimmering in a glass of champagne and thought how wonderful it would be to capture that image in a fragrance.” I’d say to put those chandeliers and champagne in the hard sparkle of Versailles’ Hall of Mirrors with summery bowls of roses, jasmine, and branches of orange flower, and the picture is complete. If you can’t take the aldehydes in Amouage Gold Woman or Elizabeth Taylor White Diamonds, don’t bother with Estée. However, if you like Estée Lauder Knowing but wish its roses were toned down, and it was frontloaded with a little more excitement, give Estée a try. Estée is not pretty. People chasing youth and fashion won’t know what to make of it. But, like Iris, Estée has a whole lot of style. Its sparkle would be pure sunshine on the right person. Reading reviews of Estée on the Estée Lauder website and elsewhere, it sounds like Estée's decades-long fans are not happy about recent reformulations. To complicate matters, in its latest House of Estée Lauder packaging, Estée is offered as a “Super Eau de Parfum,” which is supposed to be between a Parfum and Eau de Parfum in strength. In the recent past, it was sold as a Super Cologne and as a Pure Fragrance Spray. * For this review, I sampled Estée’s latest incarnation. I also have a bottle of the Pure Fragrance Spray with a batch number that dates it as from 2008. The fragrances smell very similar to me, except that — no doubt about it — the oakmoss in the 2008 version is dirtier and more complex. However, the newer version lasts longer on my skin. Please comment if you’ve tried any of these versions over the years and can compare them to today’s version. Estée Lauder Estée Super Eau de Parfum spray is $50 for 50 ml and is available online and at many department stores. 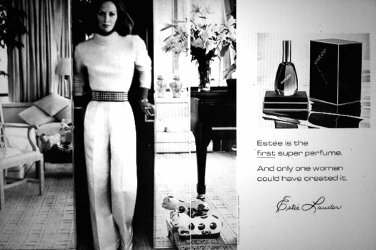 * Ed note: When it debuted in 1968, it was called the first "super perfume". I remember the cologne….hardly a cologne at all! but oh so lovely! I miss the old Estee Lauders ….Azure (am I spelling it correctly?) was great as well….and Cinnibar and Private Collection and White Linen and Aliage…(yes, I could go on and on but I really did enjoy them more than the current offerings)…interesting that they were all cologne or EDT yet seemed so much more powerful than today’s EDPs (at least to my nose). I adore the old Estee Lauders, too, and I’m so glad the company is keeping them on the market, even if they’re not “on trend.” They’re reasonably priced, too! Unfortunately, I feel that all the greats have either been discontinued, reformulated, or made into an unnecessary flanker. Estee Lauder fragrances have always been reasonably priced and just exquisitely done. My whole life I have been around women in my family who used the products. My late grandmother, my aunts ( my late aunt loved Knowing), and my mother. My mother is the reason why I tried their Private Collection. Just recently I mentioned that someone from NST made a reference to Jasmine White Moss. It was one of the great ones. I hadn’t worn it in a while and remembered how much I loved it. I went on the EL website to find out that it got the axe. I found it at Nordstroms and immediately got a bottle. I am anxiously awaiting its arrival! Oh no! No more Jasmine White Moss? That’s too bad. I’m glad you found a bottle. And thank you, eBay, for my new bottle of JWM (still in the cellophane-sealed box!) which arrived yesterday. I don’t think I’ve tried Estee yet – must remedy that! BTW, Iris Apfel used to wear Mitsouko (of course). Then she decided it wasn’t what it used to be and started wearing her husband’s Yatagan instead. Oh, now that’s brilliant! Yatagan is just the excess I’d expect from her! I must give Estee another go. It always struck me as needlessly dry, almost scratchy. I’ve never given it a proper chance, I now realise. Alert! Private Collection has disappeared from the Lauder webiste. Grab while you can people. It takes a little time to get to know Estee properly, I think. As for Private Collection, I see that the fragrance called “Private Collection” is still offered, and so is the Private Collection Tuberose & Gardenia, but I don’t see Amber Ylang or Jasmine White Moss listed any more. Too bad about their being discontinued! I thought they were nicely done. Not mind benders, but really nice. Ah yes, I was looking at the Australian site. Private Collection – the original – is gone. Tuberose Gardenia and Amber Ylang Ylang are still there. Though it lists Azuree as out of stock – and that’s my favorite! So, you’re the reflection of the U.S. market. Somehow that seems fitting! Fifty bucks for a thunderhead of aldehydes and a foghorn of oakmoss? I’m running to the store! Make sure to give it a good sampling first! And it’s around at thrift stores here and there, too, if you want an older version. Thanks for the explanation of the concentration. I allways wondered. Sounds like Poison’ Esprit de Parfum. When I was a child Esteé smelled to me like a very ‘perfumey’ perfume. Sonething harsh and unfriendly, the opposite to my mothers soft, embrasing Shalimar. I have learned to appreciate it now. You’re welcome! I wouldn’t be surprised if that initial aldehydic blast was a challenge when you were a child. I bought a bottle last month, still don’t know why, haha.. I seemed to like it in the store. when I came home after a few hours, I almost got sick of the smell, like a very cheap white washing powder…ughhhh… Lucky me, Knowing,, though reformulated, still is fantastic on me! You really have to like aldehydes and orange blossom for Estee to work on you. I’m glad Knowing is a hit, though! Now I can be relieved and place an order for the newly bottled Estee! Not having smelled the new version, I got a little worried reading all those reviews. Oakmoss, bold perfumes and EL’s “older creations” pretty much represent my preference so I too, am very grateful that EL keeps them alive (but I worry that they only keep them in production because the generation that uses them are still “with us”. I truly hope that’s not the case.)! I saw lots of comments on the EL website from people disappointed about changes in how Estee smells, so I hope my experience wasn’t an outlier. Yes, I had the same thought about why the older Els might still be on the market, and I agree! I was Intent on getting My mother another bottle of this so that she could keep her old bottle tucked away as a beautiful keepsake… I got the Super Cologne spray (which was the version my dad bought) back in like… 2009 or so… maybe a little earlier.. maybe later… but it smelled just like the original… it may have been slightly reformulated but i don’t think it was a Radical reformulation. Haven’t smelled the current version, but since Mom is working with something near 100 fragrances in her rotation, she doesn’t really have to worry about running out of it! You are right… This is a Fragrance Atom Bomb… I am always surprised that at such a young age when she first was wearing the scent that it wasn’t overwhelming… yet as I have come to realize, Mother can wear those BIG scents and they smell DIVINE! She loves White Diamonds, Chanel No. 5, Miss Dior. White Linen, Opium… all those Room clearers she wears and smells Elegant and Polished! I have always detected a Vanillic note in the Mid-to-Base of Estee, I don’t know if it’s listed in the ingredients… but I SWEAR I smell it! I love the Aldehydic Opening and I have always loved that intrusion of Lily-Of-The-Valley in the midst of all those radiant Aldehydes!! And the powdery finish I have always loved… Didn’t even realize that it was Iris until now and I should have detected that… but I guess it is a fragrance I love not for it’s Brilliant composition, (I couldn’t care less what it’s comprised of!) I just ADORE This scent! Thank You for your EXQUISITE Review! I MUST Send you the last little Amount of a RARE Fragrance called “Pretexte” By Lanvin… I think you’ll love the scent, I 2 bottles, one my mom has and it’s nearly full. this one is down to it’s last drops but is potent enough to make one’s head swirl! I ADORE You! Take Care! You are too kind! And your offer of Pretexte is wonderful, but I already have a sample. (I am going to dig it out just as soon as I finish this comment, because now I am eager to try it.) I adore your comments–they’re always full of story and passion. Your mother sounds remarkable. She must be remarkable to wear Estee so well at so young an age!